CAMBRIDGE — The World Bank, one of the most powerful financial institutions on the planet, is experimenting with blockchain as a tool to track agricultural goods and raise capital. Gideon Lichfield, the editor in chief of the MIT Technology Review, found some irony in that. “This technology that was invented by somebody whose true identity we still don’t know — Satoshi Nakamoto — specifically to take power away from financial institutions and put currency in the hands of the people is now being used by the ultimate, central, financial institution,” Lichfield told an audience at EmTech 2018, a conference focused on big data, artificial intelligence and technology. The crowd gathered at MIT’s Media Lab had just heard from two thinkers in the increasingly mainstream field of blockchain, a method of distributed ledgers that can dramatically alter how transactions are made and verified. Ledgers themselves date back to cuneiform records etched into tablets 7,000 years ago at the dawn of civilization, said Michael Casey, an author and senior advisor to the Digital Currency Initiative at Media Lab. If blockchain solutions decentralize financial ledgers in the future, that change could disrupt the flow of money into the world’s financial hubs. Using the 21st century version of the ledger, governments and other institutions could invest the money they save on financing in other causes. The lack of trust in the record-keeping function has a huge impact on the world. Blockchain solutions could also help the so-called underbanked and unbanked gain access to financial services. Distributed ledgers accrue credibility by replicating transaction records across a network of computers. Casey said that credibility could benefit people in places like Nairobi, Kenya, who have difficulty leveraging value from their real estate because banks distrust their property records. “The lack of trust in the record-keeping function has a huge impact on the world,” he said. The World Bank’s Prema Shrikrishna and MIT Media Lab’s Michael Casey discuss blockchain’s potential to provide a new model of trust at EmTech 2018. The altruistic applications of blockchain were a focus of Casey’s EmTech talk with Prema Shrikrishna, who works on blockchain projects at World Bank Group. Teaming up with the International Finance Corporation, the World Bank is currently designing a blockchain architecture to track oil palm from the farm to mills, where it becomes palm oil — an agricultural staple in everything from chocolate to candles. By tracking the origin of the raw material, most of which is produced in Indonesia, blockchain could reward farmers for sustainable practices, according to Shrikrishna. Education. The World Bank is developing a system for rewarding students playing an educational game called Evoke, which is designed to teach skills for success in modern society, Shrikrishna said. Financing. In August, the World Bank sold blockchain-enabled bonds through the Commonwealth Bank of Australia, which raised about $80.5 million, according to Reuters. Members of the audience at the talk had varying aspirations for blockchain’s use. Rahul Panicker, chief innovation officer at Wadhwani Institute for Artificial Intelligence, which focuses on technological solutions to large-scale societal problems, believes blockchain can be harnessed for humanitarian causes. Tom Hennessey, an attendee, posited that financial settlement was the most readily available application. Tomas Jansen, of Belgium’s Federal Agency for the Reception of Asylum Seekers, said a lot of refugees arrive in Europe without identification papers because they belong to a marginalized group or lost their documents. Jansen wanted to hear ideas from the blockchain experts on how to address those problems. World Bank is hardly alone in its exploration of blockchain solutions to solve problems and change how business is done. Analysts expect blockchain to have a major impact on businesses, which are eyeing its potential to manage supply chains, verify documents, and trade securities. The firm Gartner estimates blockchain will add $3.1 trillion to the world economy by 2030. Some industry sectors have been quicker than others to start experimenting. Describing blockchain as at an “inflection point,” a recent report by the consultancy Deloitte found that financial services executives are “leading the way in using blockchain to reexamine processes and functions that have remained static for decades,” and emerging players are using blockchain to challenge traditional business models. Meanwhile, blockchain’s most developed use case — bitcoin — is driving most of the interest in the technology, while taking those invested in the cryptocurrency on a roller coaster ride. So far development of a “stable coin” has been a “difficult nut to crack,” according to Casey, who used to cover currencies for The Wall Street Journal. To stabilize the tender, a coin could be pegged to other metrics, or it could be backed by a reserve of funds to try to create more stability, Casey said. One way or another, he predicted, developers will find success. “Something’s going to work. Something’s going to break as well,” Casey said. I’m Bonnie Ross and I’m incredibly honored to lead of one of the most iconic and beloved video game franchises in the world, in Halo. Our team at 343 Industries tells epic sci-fi stories, we build incredible worlds and I’ve enjoyed a more of a creative career than I ever thought possible: one where technology empowers art. I lead the most amazingly talented team of engineers, computer programmers, artists, and storytellers – all working together to bring the world of Halo to millions of passionate fans globally. Halo is a universe worthy of devotion, a universe in which you can tell thousands of stories – and technology brings all this magic vividly to life. Throughout middle school, high school and college, my dad encouraged me to think about pursuing engineering and science as a career. In high school, he pushed me to take the advanced math and science classes, even though I didn’t understand the “why.” I couldn’t see the opportunities that lie ahead. I needed that push. I needed those words of encouragement. I couldn’t be more thankful that my dad gave me that support. When I graduated from college, I managed to land a job with Microsoft working on operating systems. While it was an amazing job – especially for someone fresh out of college – I don’t think I would have stayed at Microsoft or in tech, if I didn’t eventually find my passion. At that time, I wasn’t able to connect the dots and see why technology mattered to me. Luckily, four years after I started at Microsoft, I found video games. For me, video games made that connection to what I could do with technology…be creative. Gaming is this amazing merging of art and technology. Gaming is technology empowering art, creativity, and storytelling. Gaming opened my eyes to the extraordinary things I could achieve with technology. For me, pursuing and remaining in technology, as a career, wasn’t something I would have done without a little help. That’s why I’ve made it my mission to inspire and encourage girls and nurture other women to pursue careers in computer science and technology. There is such a need for talent – girls and boys – in technical fields, particularly in the United States. Studies show that girls lose interest in STEM (Science, Technology, Engineering, Math) and computer science as time goes on. In middle school, 31% of girls believe that jobs requiring coding and programming are “not for them.” In high school, that percentage jumps up to 40%. By the time they’re in college, 58% of girls count themselves out of these jobs. In the next two years, there will be an estimated 1.4M jobs in the US that require some form of technical experience or degree. Based on the number of students enrolled in technology and engineering degrees today, it’s predicted we will only be able to fill 400,000 of these jobs in the US. Such a profound worker shortage carries global implications for the US and our economy. Research shows a diverse workforce brings with it diverse perspectives that improve everything from better product development to better teams to better profits. We need women engineers. And it’s not just a nice thing, it can change everything. Anatomically female crash test dummies, with associated differences in physique and physics, weren’t used until 2011 and women were less safe for it. A 2011 University of Virginia study found that women had a 47% higher change of serious injuries compared to men and a 71% higher chance of a moderate injury. STEM jobs tend to be higher paid. The lack of women going into technology or engineering or science is contributing to the salary gap between men and women. And here’s the not-so-secret secret: If you have a degree in tech, companies around the world aren’t just looking for you. They’re fighting to hire you since we’re all competing for a very small pool of qualified female candidates. Microsoft recently conducted research to learn more about what causes the gender gap and how to close it. We know why girls or young women either don’t go into STEM or leave. The research echoes my own story growing up. And we know what girls need to stay in STEM. It’s also what I personally needed. Connect the dots for girls. Girls often leave STEM because they don’t understand the potential and opportunities a technology or engineering degree can provide. 91% of girls say that they’re creative and 72% say it’s important that they have a job that helps the world, so I’m sharing my story to show that they can achieve both of those goals with a STEM qualification. As a parent or educator, you can do the same. Seek and tell the computer science story. When girls learn about real-world STEM jobs, their perception of the creativity and positive impact of STEM double. Coding is the fabric our modern lives, built on and technology, and continues to shape and improve our world. Let her know she can define, drive and be that change. Be a mentor. Girls need encouragement to stay in STEM. I was lucky to have my dad and I’m convinced that without his encouragement of my STEM education, I wouldn’t be where I am today. 65% of middle school girls who are encouraged by a parent say they’re likely to study computer science in high school, compared to 36% who haven’t been encouraged by either parent. With mutual support from parents and teachers, girls are twice as likely to consider studying computer science in high school, and three times more likely to consider studying computer science in college. You don’t need to be an engineer to encourage girls to pursue STEM and inspire their confidence in math and science. Just help them imagine their future with a computer science education. This summer, I had the privilege of spending the day with 11 amazing young girls to work on a project for the Ad Council’s latest communication campaign, to encourage more girls to pursue careers in STEM. These girls are our future. They were surprised and enthused to discover how math and science can be creative and can lead to a career making video games. We talked about what games they play, what experiences and stories they want to create, and I made sure to tell them that they could achieve that and that would change the world. Technology is the most powerful and the most creative tool we have today to create impact; to change and improve the world. Join me in raising the next generation of world-builders and world-changers. Connect the dots and be a mentor for the girls and young women in your life. Please share your story, my story, share the #SheCanStem videos and inspire the next generation. #MakeWhatsNext. Today we are announcing Azure DevOps. Working with our customers and developers around the world, it’s clear DevOps has become increasingly critical to a team’s success. Azure DevOps captures over 15 years of investment and learnings in providing tools to support software development teams. In the last month, over 80,000 internal Microsoft users and thousands of our customers, in teams both small and large, used these services to ship products to you. Each Azure DevOps service is open and extensible. They work great for any type of application regardless of the framework, platform, or cloud. You can use them together for a full DevOps solution or with other services. If you want to use Azure Pipelines to build and test a Node service from a repo in GitHub and deploy it to a container in AWS, go for it. Azure DevOps supports both public and private cloud configurations. Run them in our cloud or in your own data center. No need to purchase different licenses. Learn more about Azure DevOps pricing. 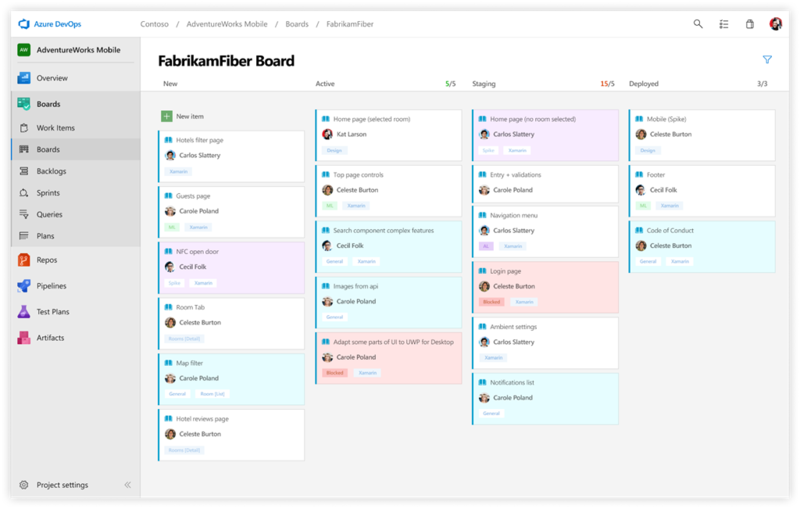 Alternatively, here’s an example of a developer using all Azure DevOps services together from the vantage point of Azure Boards. 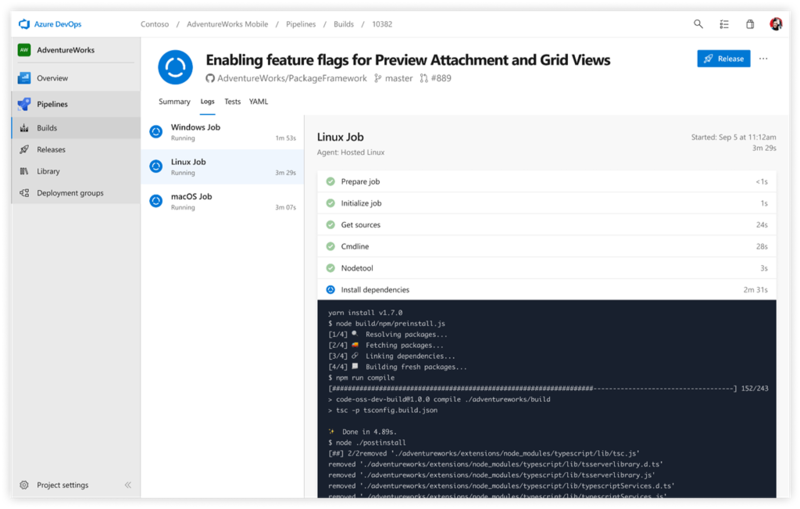 As an extension of our commitment to provide open and flexible tools for all developers, Azure Pipelines offers free CI/CD with unlimited minutes and 10 parallel jobs for every open source project. With cloud hosted Linux, macOS and Windows pools, Azure Pipelines is great for all types of projects. Many of the top open source projects are already using Azure Pipelines for CI/CD, such as Atom, Cpython, Pipenv, Tox, Visual Studio Code, and TypeScript – and the list is growing every day. We want everyone to have extremely high quality of service. Accordingly, we run open source projects on the same infrastructure that our paying customers use. Azure Pipelines is also now available in the GitHub Marketplace making it easy to get setup for your GitHub repos, open source or otherwise. Azure DevOps represents the evolution of Visual Studio Team Services (VSTS). VSTS users will be upgraded into Azure DevOps projects automatically. For existing users, there is no loss of functionally, simply more choice and control. The end to end traceability and integration that has been the hallmark of VSTS is all there. Azure DevOps services work great together. Today is the start of a transformation and over the next few months existing users will begin to see changes show up. What does this mean? URLs will change from abc.visualstudio.com to dev.azure.com/abc. We will support redirects from visualstudio.com URLs so there will not be broken links. As part of this change, the services have an updated user experience. We continue to iterate on the experience based on feedback from the preview. Today we’re enabling it by default for new customers. In the coming months we will enable it by default for existing users. Users of the on-premises Team Foundation Server (TFS) will continue to receive updates based on features live in Azure DevOps. Starting with next version of TFS, the product will be called Azure DevOps Server and will continue to be enhanced through our normal cadence of updates. Keynote: Watch our live Azure DevOps keynote on September 11, 2018 from 8:00 – 9:30 AM Pacific Time. Live training: Join our live Mixer workshop with interactive Q&A on September 17, 2018 from 8:30 AM – 2:30 PM Pacific Time. You can save-the-date and watch both live streams on our events page. There you’ll also find additional on-demand videos and other resources to help get you started. We couldn’t be more excited to offer Azure DevOps to you and your teams. We can’t wait to see what amazing things you create with it. For students and educators around the world now heading back to school, it’s a time filled with emotions and opportunities to make new friends, connect with old ones, and embark on new learning opportunities. For one school in Bellevue, Washington, it’s been a momentous week: Wilburton Elementary opened its doors to a new community of students, parents, and educators, for the very first time. Over the past year we’ve been sharing this school’s journey, from its earliest planning stages to partnering with Wilburton to bring the Microsoft Education Transformation Framework to life every step of the way. More than 400 Wilburton Wolves are in for an amazing year ahead, and I couldn’t be prouder of what the teams have accomplished in creating a holistically impactful environment for these students to dream big, expect more, and give back. What I’ve learned over the years, through our Showcase School program, is that amazing schools are the output of an incredible leader. Beth Hamilton, Wilburton’s passionate and energetic principal, is a testament to turning a vision into a real-life, fully functioning school. Hamilton has been a leading light throughout the entire project, ensuring that every detail – from the building construction, the design of the learning environments, through to the learning approach – has placed students at the heart of every decision. It’s been a privilege to work alongside Beth and listen and learn along the way. And what we’ve learned throughout the journey will help inspire and educate the next generation of new schools. The Microsoft Education Transformation Framework (ETF) has been instrumental in helping Hamilton to consider every aspect of learning and design. Across Leading and Policy, Modern Teaching and Learning, Intelligent Environments, and Technology Blueprint, we’ve trialed and tested various approaches and options to best craft this amazing new place to learn. And the new teachers at Wilburton couldn’t be more excited. Wilburton’s educators, some of them brand new, spent the summer getting their classrooms ready and investing in their own development. Leveraging the Teaching and Learning component in the ETF, along with resources like the Microsoft Educator Community, these educators participated in over 100 hours of professional development, with a focus on connecting as a team and going deep with the innovative technologies designed to take student learning and experience to the next level. And all of Wilburton’s staff is looking forward to the new resources they can access – including their partnership with nearby Bellevue Botanical Garden and the school’s learning terrace, which is an indoor/outdoor environment connected to their Maker Space. It’s an area for raised gardens, creativity, community building, with all the resources of a classroom. The school is also designed with pods that create open spaces, for students in different classes to connect as a community. From the very beginning, the school was designed to consider opportunities for technology to play a key role in driving digital transformation in both the learning environments and the efficiency and effectiveness of the school and facility itself. Using the Microsoft Education Transformation Framework, they executed on a plan that identified the tools their students and educators need today, and the systems and solutions the school needs to be more productive, efficient, and secure. Wilburton Elementary provides every student with access to a device while they are at school, where they will use Office 365 with digital inking and a stylus to support their ability to collaborate with each other and be more productive. Microsoft Teams, OneNote, Forms and more will be used throughout the school to enable learning, improve feedback and assessment, and provide more personalized learning to every student. The school is also taking a holistic approach to accessibility and inclusion, using Microsoft Learning Tools to support every student, regardless of learning differences. STEM is considered fundamental in the curriculum, with the Maker Space leading to hands-on experiences, Minecraft and MakeCode introducing coding and creative thinking, and computer science serving as core. Throughout the journey, Wilburton leaned on the advice and support of many partners and stakeholders in the process, including Microsoft, ISTE, NPDL, Sam Labs, ST Math, Steelcase and local community partners. Wilburton’s journey has been a learning experience for Microsoft, too. Putting innovation into practice continues to inform our products and our relationships with schools, educators, and students. We’re also excited to share the Wilburton story with the many education officials, school leaders, and educators, who visit the Microsoft Redmond campus every year. As part of our collaboration, Wilburton has a dedicated space for Microsoft to welcome those who want to learn more about the school from both students and educators. As this part of the journey ends, another one (this time, with students!) begins, and we’ll be there every step of the way to provide support. Congratulations and best of luck to the entire Wilburton Elementary community! Thank you for an amazing journey. I am humbled that you chose Microsoft be a part of it. Learn more about becoming a Microsoft Showcase School. If it’s September, it’s time for Mobile World Congress Americas. And this year’s conference, scheduled for next week in Los Angeles, will be all about 5G services, wrote Kathryn Weldon, an analyst at GlobalData, based in London. “Clearly we are closer to actual 5G rollouts, so all vendors and operators that participate in the 5G value chain will be touting their wares, anticipating and touting possible use cases, and amping up the excitement,” she wrote. Weldon said she does not believe next week’s Mobile World Congress will yield any major product announcements. Instead, she categorized education as the show’s biggest benefit, especially around 5G services. Among those new capabilities will be enhanced video broadcasting, advanced interactive gaming systems and anything that can benefit from low latency, Weldon said. 5G services won’t be the only technology discussed at Mobile World Congress Americas. The event will also showcase other wireless trends, including low-power WANs, internet of things and, of course, business transformation. What’s a show without some mention of transformation, after all? Find out what else — beyond 5G services — Weldon said attendees should look for at next week’s Mobile World Congress Americas. VMware wasn’t always a fan of the cloud, but it sure is now, said Drew Conry-Murray, in a Packet Pushers post. The vendor pitched its virtual cloud network architecture at last month’s VMworld, with executives telling attendees to make VMware software the foundation for all of their enterprises’ multi-cloud operational requirements — from security to management. The reason why? The vendor does not want to be cast aside as more applications rely on a public cloud infrastructure that does not require VMware, Conry-Murray said. VMware’s approach could work, but it won’t be inexpensive. Or easy, Conry-Murray said. Read Conry-Murray’s other observations about VMware’s embrace of multi-cloud. Platform wars: The next phase of enterprise security? Jon Oltsik, an analyst at Enterprise Strategy Group in Milford, Mass., said CISOs are increasingly looking for a single vendor to provide the tools they need to secure their networks. That may be an efficient way to go, but most enterprises have a dizzying list of security needs they must meet, and finding a security platform capable of supporting all those requirements is not easy. But that’s where Oltsik and his colleague, Doug Cahill, come in. The two developed a list of eight attributes they said every cybersecurity platform must offer. Then they interviewed more than 200 cybersecurity professionals to identify the three attributes they consider most important. Among the attributes cited: ease of management and coverage that includes major threat vectors such as email and web security. Almost 40% of those surveyed said email and web security is a must, while 33% said they needed a platform that offered central management across all products and services. Find out what else survey respondents had to say about cybersecurity platforms. Preliminary results of a new Microsoft study show teenagers around the world are increasingly turning to their parents and other trusted adults for help with online problems — an encouraging development as the new school year begins. More than four in 10 teens (42 percent) from 22 countries who encountered online issues said they asked their parents for help, while 28 percent said they sought advice from another adult such as a teacher, coach or counselor. Those figures are up an impressive 32 and 19 percentage points, respectively, compared to last year’s findings which showed only 10 percent of young people turned to their parents for advice and just 9 percent asked for help from other adults. In addition, adults and teens across the globe say parents are by far the best placed of any group to keep young people and families safe online. Results show parents have both the greatest potential — and were deemed the most effective — at promoting online safety among young people, teens and families. The findings are from the latest research associated with Microsoft’s work in digital civility — encouraging safer and healthier online interactions among all individuals and communities. The study, “Civility, Safety and Interaction Online — 2018,” polled teens ages 13-17 and adults ages 18-74 in 22 countries[i] about more than 20 online risks. This latest research builds on similar studies conducted over the previous two years, which polled the same age groups in 23 and 14 countries, respectively. A total of 11,157 individuals participated in the latest research. Teenage girls were more likely to ask for help from their parents (44 percent of girls vs. 37 percent of boys) and from other trusted adults (29 percent of girls vs. 26 percent of boys), the study shows, likely because life online in general is harder on girls than boys. Indeed, the data demonstrate that girls have a higher level of online risk exposure than boys; they suffer more consequences and “pain” from online ills, and the online risks and abuse that they experience are more emotionally charged. Moreover, as online risks have grown in severity — think “sextortion” and “swatting”[ii] — young people are perhaps more inclined to seek advice from the older generation. Based on her experience, Dr. Cooper spoke of chronic anxiety, depression and a rational paranoia as just some of the resulting harms from negative online experiences. “Sadly, research has shown that some link to cybervictimization has become the issue in nearly 50 percent of cases of suicidal thoughts resulting in seeking care in emergency rooms,” she added. And, some of these consequences were borne out in our research. Two-thirds (66 percent) of female teenage respondents reported being exposed to online risks vs. 60 percent of male teenage respondents. Nearly three-quarters (73 percent) of girls reported negative consequences following an online issue compared to 67 percent of boys, and the level of pain associated with online risks and the intensity of the attendant emotions — namely fear, anger and sadness — were higher for girls. Personal / Intrusive – Being the target of unwanted contact, experiencing discrimination, swatting, misogyny, exposure to extremist content/recruiting, or falling victim to hoaxes, scams or fraud. We will post at least one other early look at some other key findings in the weeks ahead. In the meantime, to learn more about digital civility and how you can become a champion for these common-sense online practices, visit www.microsoft.com/digitalcivility. For more on online safety generally, visit our website and check out and share our resources; “like” us on Facebook and follow us on Twitter. [ii] In the study, “swatting” is defined as deceiving emergency services like police, fire or medical into sending an emergency response team, typically to a person’s home, based on a false report of an ongoing critical incident or crime. It’s clear that democracies around the world are under attack. Foreign entities are launching cyber strikes to disrupt elections and sow discord. Unfortunately, the internet has become an avenue for some governments to steal and leak information, spread disinformation, and probe and potentially attempt to tamper with voting systems. We saw this during the United States general election in 2016, last May during the French presidential election, and now in a broadening way as Americans are preparing for the November midterm elections. Broadening cyberthreats to both U.S. political parties make clear that the tech sector will need to do more to help protect the democratic process. Last week, Microsoft’s Digital Crimes Unit (DCU) successfully executed a court order to disrupt and transfer control of six internet domains created by a group widely associated with the Russian government and known as Strontium, or alternatively Fancy Bear or APT28. We have now used this approach 12 times in two years to shut down 84 fake websites associated with this group. Attackers want their attacks to look as realistic as possible and they therefore create websites and URLs that look like sites their targeted victims would expect to receive email from or visit. The sites involved in last week’s order fit this description. We’re concerned that these and other attempts pose security threats to a broadening array of groups connected with both American political parties in the run-up to the 2018 elections. That’s why today we are expanding Microsoft’s Defending Democracy Program with a new initiative called Microsoft AccountGuard. This initiative will provide state-of-the-art cybersecurity protection at no extra cost to all candidates and campaign offices at the federal, state and local level, as well as think tanks and political organizations we now believe are under attack. The technology is free of charge to candidates, campaigns and related political institutions using Office 365. As a special master appointed by a federal judge concluded in the recent court order obtained by DCU, there is “good cause” to believe that Strontium is “likely to continue” its conduct. In the face of this continuing activity, we must work on the assumption that these attacks will broaden further. An effective response will require even more work to bring people and expertise together from across governments, political parties, campaigns and the tech sector. Importantly, these domains show a broadening of entities targeted by Strontium’s activities. One appears to mimic the domain of the International Republican Institute, which promotes democratic principles and is led by a notable board of directors, including six Republican senators and a leading senatorial candidate. Another is similar to the domain used by the Hudson Institute, which hosts prominent discussions on topics including cybersecurity, among other important activities. Other domains appear to reference the U.S. Senate but are not specific to particular offices. To be clear, we currently have no evidence these domains were used in any successful attacks before the DCU transferred control of them, nor do we have evidence to indicate the identity of the ultimate targets of any planned attack involving these domains. Microsoft has notified both nonprofit organizations. Both have responded quickly, and Microsoft will continue to work closely with them and other targeted organizations on countering cybersecurity threats to their systems. We’ve also been monitoring and addressing domain activity with Senate IT staff the past several months, following prior attacks we detected on the staffs of two current senators. Despite last week’s steps, we are concerned by the continued activity targeting these and other sites and directed toward elected officials, politicians, political groups and think tanks across the political spectrum in the United States. Taken together, this pattern mirrors the type of activity we saw prior to the 2016 election in the United States and the 2017 election in France. Threat notification across accounts. The Microsoft Threat Intelligence Center will enable Microsoft to detect and provide notification of attacks in a unified way across both organizational and personal email systems. For political campaigns and other eligible organizations, when an attack is identified, this will provide a more comprehensive view of attacks against campaign staff. When verifiable threats are detected, Microsoft will provide personal and expedited recommendations to campaigns and campaign staff to secure their systems. Security guidance and ongoing education. Officials, campaigns and related political organizations will receive guidance to help make their networks and email systems more secure. This can include applying multi-factor authentication, installing the latest security updates and guidance for setting up systems that ensure only those people who need data and documents can access them. AccountGuard will provide updated briefings and training to address evolving cyberattack trends. Early adopter opportunities. Microsoft will provide preview releases of new security features on a par with the services offered to our large corporate and government account customers. You can read a more complete description of Microsoft AccountGuard in today’s blog by Tom Burt, the corporate vice president who heads Microsoft’s Customer Security and Trust group. Since we launched Microsoft’s Defending Democracy Program in April, we have focused on four priorities: protecting campaigns from hacking, protecting voting and the electoral process, increasing political advertising transparency, and defending against disinformation campaigns. In the coming months, we will offer AccountGuard in additional countries, as we continue to invest in and evolve other aspects of the Defending Democracy Program. Our Defending Democracy Program is an important piece of our work to protect customers and promote cyberdiplomacy around the world. While cybersecurity starts with Microsoft and other companies in the tech sector, it’s ultimately a shared responsibility with customers and governments around the world. Together with our industry partners, we’ve launched the Cybersecurity Tech Accord, now endorsed by 44 leading tech companies to protect and empower civilians online and to improve the security, stability and resilience of cyberspace. And we will continue to call for stronger adherence to existing international norms and the creation of new international laws – like a Digital Geneva Convention. As last week’s court order and today’s AccountGuard initiative reflect, we are committed not only to stronger principles and laws but stronger action as well. We can only keep our democratic societies secure if candidates can run campaigns and voters can go to the polls untainted by foreign cyberattacks. Democracy requires vigilance and at times action by citizens to protect and maintain it. No individual or company can hope to meet this imperative by itself. We all need to do our part. We’re committed to doing our part by helping to protect candidates and campaigns in preserving their voices and votes no matter what party they support. How does self-described “Trend Curator” Rohit Bhargava navigate the future? By shredding magazines and planting sticky notes. Throughout each travel-packed year of international speaking and teaching, he collects untold piles of periodicals, then skims, tears and screens their editorial and advertising content for clues to what’s now, what’s new and — most of all — what’s going to be influential in the years to come. Using what he calls his “haystack method,” Bhargava sorts and sifts and shifts the material he and his team have found. Gradually, connections are made, combinations arise, synchronicities emerge and trends appear. He compiles what he gleans in an annual series of books called “Non Obvious: How To Predict Trends And Win The Future,” which have been published in more than a dozen languages. These have schooled more than a million businesspeople and interested civilians about the cultural currents, jet streams and eddies that shape our lives. His omnivorous media diet includes everything from legacy magazines like The Atlantic and Variety to city magazines (Washingtonian), alumni magazines (Emory magazine), specialty publications (USA Philatelic, Adweek), foreign in-flight magazines and periodicals definitely not published with him in mind (Teen Vogue, Modern Farmer). The irony of a “near-futurist” relying so heavily on paper in the digital age is not lost on him. The irony of a ‘near-futurist’ relying so heavily on paper in the digital age is not lost on him. “I think that people are more surprised about that than I am,” Bhargava said. “What you see is the paper. What you don’t see is my Feedly account, where I read hundreds of stories each week.” He also relies on conversations at conferences and interviews by his associates. But Bhargava sees a certain tactical advantage in scanning a vast amount of information in physical form. Bhargava was born in India and came to the United States at 6 months old. After studies at Emory University he moved to Australia in 1998 and began his career at a company called Dimension Data, where he worked for three years before joining the Sydney office of advertising agency Leo Burnett. He returned to the U.S. in 2003 and started working the following year in Washington at Ogilvy. He stayed at that advertising agency until 2012, when he left to start his own consultancy. Conference and convention planners appreciate the experiences Bhargava himself provides — he speaks at upward of 50 events a year, in addition to consulting with individual companies and teaching smaller groups. “My goal is to give them something they can do, not just inspire them,” he said. He wants to help his audiences find interesting ideas in unexpected places. While he may appreciate tradition and rigorous methodology, he is anything but a stickler for doing things the way they’ve always been done. “Our habits are really hard to unlearn,” he told an audience at a recent construction software convention in San Antonio. “The things that we know, the best practices, are really hard to abandon. If we are going to be innovators, we are going to have to leave some things behind. That’s why one of his five rules for Non-Obvious thinking is to “be fickle” — in other words, keep it moving. The others are “be observant,” “be curious,” “be thoughtful” and “be elegant.” That final command is the guide for the pithy names he likes to assign to the trends he observes. For example, ”brand stand” is his term for how corporations can make themselves more attractive by backing up their work with socially conscious messaging and actions. (“The job of marketing is not to sell a car, it’s to get people to come into the dealership,” Bhargava explained.) “Predictive protection” is what he calls device makers working to anticipate and defend user vulnerabilities. And “approachable luxury” is the idea that experiences and objects that evoke authenticity and sincerity are now sometimes considered as valuable as high-end products from legacy makers. In addition to isolating 15 trends for each edition of the Non Obvious books, he also looks back at previous years to reassess the accuracy of his own predictions. Take two from 2013: ”precious print” and “branded inspiration.” While consumers’ fondness for books and print media in general hasn’t waned (Bhargava still gives that trend an A five years later), brands are less willing to stage dramatic one-off events to stand out (today he gives that one a C). While reevaluating trends, Bhargava realized he could also present them in new ways. He is increasingly using data visualization as a storytelling tool. The Microsoft Power BI platform allowed him to create The Non-Obvious Trend Experience, a periodic table of elements-style dashboard that shows how trends connect across years, industries and areas of interest. The playful, informative Power BI dashboard is yet another product of an ever-expanding Non-Obvious universe. He’s planning what he calls “the most Non-Obvious thing to do,” a short-form podcast about the past hosted by a futurist. And he and his wife, Chhavi, are co-owners of the publishing imprint Ideapress, which has published 22 books and has another 12 coming soon. His own contribution to the series will be a volume on running a small business. “I think any of us can be more innovative, more creative,” he told his San Antonio audience. “We just have to give ourselves permission to do it.” He demonstrated that the following morning by leading a workshop of about two dozen executives and staffers. They gathered around tables piled high with magazines. Curation is the ultimate method for transforming noise into meaning. In under an hour, the participants caught a glimpse of what is for Bhargava a year-round process producing mounds of material that gain more meaning with age and comparison. “Sometimes we have to give ourselves a little bit of time,” he said. He thinks of his haystack method as akin to collecting frequent flyer miles. The ideas are there, mounting over time, ready be cashed in when they’re needed. Even if the noise is as much the shredding of magazines and riffling of sticky notes as it is the rising, roaring tide of cultural chatter. Now in its 16th year, Microsoft’s Imagine Cup has a mission to empower student developers to bring their technological innovations to life. Competing students create technology solutions with the potential to change the world. This week, 49 finalist teams are in Seattle for the 2018 World Finals. Students will compete for the chance to win up to $100,000 and a mentoring session with Microsoft CEO Satya Nadella. In addition, three special $15,000 prizes were also introduced this year to challenge students to bring forward their ideas in Artificial Intelligence, Big Data and Mixed Reality.